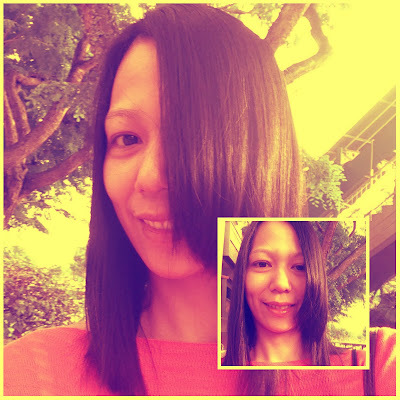 Finally, I got to visit Winn's Home Salon last month to have a Shiseido Soft Rebonding done. I remember calling Winn sometime last year to book an appointment but couldn't get one due to conflict in my work schedule. This time around, I took a day off from work. After putting my little rabbit to sleep around 2pm, off I went to Winn's Home Salon. I was so happy to find out they actually moved to an HDB flat just across Tampines MRT station. When I called them last year, they were located somewhere near our parish church which is not very convenient for a commuter like me. My appointment was at 3pm but I arrived earlier because I left the house as soon as my little rabbit went to slumberland. I was immediately attended to by Winn herself. I contemplated on having a perm done but she said it will be difficult to maintain so I ended up having Shiseido Soft Rebonding because like I mentioned here, I am already due for rebonding anyway. See the little girl behind me in the above photo? She was actually helping her mom to sweep my hair that scattered on the floor. I find it so sweet, it made me wish I could work at home too so that I could see what my kids do whilst working. I have to start thinking of a way on how I could earn while at home. Haha! Back to the rebonding treatment, it was my first time going to a home salon and the service isn't bad at all. Winn's Home Salon is well-equipped and it's air-conditioned too. Winn isn't the chatty-type of hairstylist, she respects her customer's privacy. It would be a plus point for good service if she offers water to her clients. In the middle of the 3-hr rebonding treatment, I felt so thirsty I couldn't help but ask for a glass of water. Nonetheless, I am extremely satisfied with the rebonding treatment done. Took the above photos right after I came out from the salon. Please look at my freshly rebonded hair, not my shameless eyebags and huge eyes. LOL. I will definitely come back to Winn's Hair Salon for a trim and other hair treatments. Branded good quality Shiseido product from Japan. Absolutely straight hair in great soft and crystallizing condition, making hair smooth, silky and manageable. My hair is now perfectly straight and tangle free, just the way I like it!